I’m not really sure I knew of the “dead mall” phenomenon until 1998 or 1999, which seems to be when the first generation of these retail elephants started to drop. That was also around the time that I lived in the midwest, and my blogging pal Prangeway and I would troll around a seven-state area looking at all kinds of malls and shopping centers. At the time, we were technically more interested in finding the good malls–you know, the ones with 5 anchors and 200 stores and all the “cool” places to shop. We found something entirely different than what we’d expected, and those trips really opened our eyes to the phenomenon of dying malls, making us realize that many of these centers (and perhaps the enclosed mall in general) is in the twilight of its life. It was a far more dramatic revelation than any Abercrombie-kid packed malls could offer. As a result of a ridiculously wrong turn, we found this gem, tucked away in the suburbs north of St. Louis. Somewhat hilariously, we parked outside of a wig store that had occupied one of the store shells at the time, hoping to cut through the wig store (seen here, in much worse shape than in 1999) into the then-long-dead River Roads Mall. I can’t believe we actually expected it to be open–it pretty much looked like this when we were there seven years ago. I guess River Roads Mall bit it sometime in the mid-1990s, and has long been scheduled to be redeveloped into a mixed-use complex with a heavy residential component. If it ever gets off the ground, it’ll hopefully help the area a bit. It seemed like it had fallen into pretty severe decline (at least in 1999…). Apparently demolition began very recently, and this blog has some great River Roads Mall demolition photos up from just this past week. I didn’t carry a camera back then, but I found these dramatic photos of River Roads Mall online. 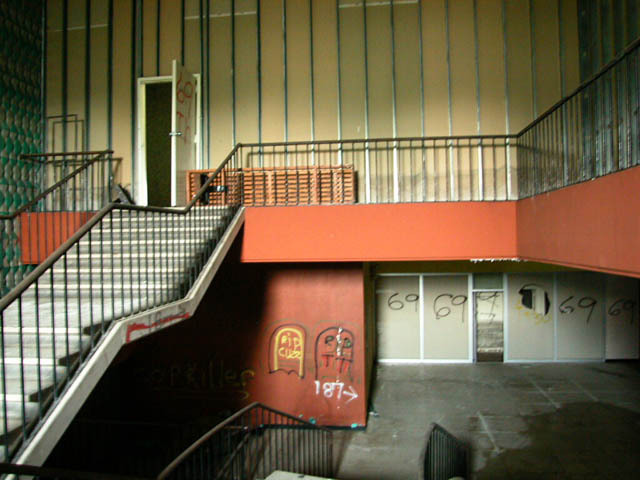 They’re really cool because it’s quite a rarity to find interior shots of a mall that’s been closed up for so long. They were taken in 2004 by Michael Allen for his website, Ecology of Absence, which chronicles all kinds of structural dead things (including tons of non-retail stuff) and is well worth checking out if you’re curious about urban decay, especially in the St. Louis area. Also check out Toby Weiss’ fantastic site, which includes a lot of great, black and white, artsy shots of forlorn retail establishments, and really captures the sadness in the buildings. There are also more pictures where these came from. 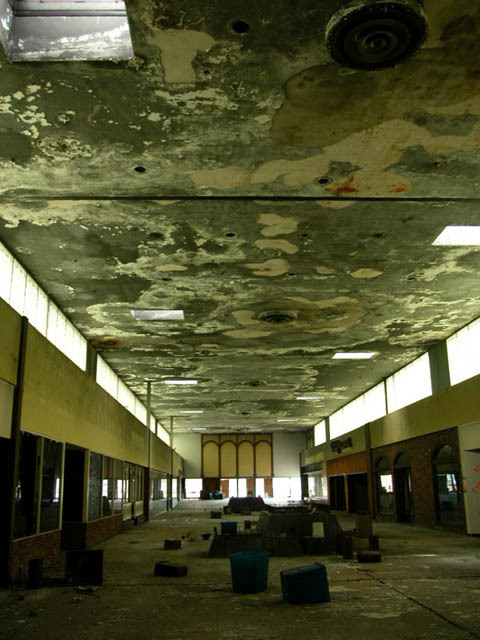 And as usual, for more history from people who have some familiarity with the place, check out dead malls. Thank you for the interest in River Roads Mall, and for sharing the photos. One correction: The photos on Ecology of Absence are mine, not Toby Weiss’. Gosh. This is terrible. This is like “Beneath the Planet of the Apes”-underground-New York terrible. I expect to find the shrine to the atom bomb up in this hea place. But alas, it ended with a whimper. Is this the sign of a society in decline? What would Dr Zaius think of our new lifestyle centers? Towne Centres? It looks like the mall has come full circle. I remember as a kid when the mall was first built that the skylights leaked for years. During a rainstorm there were 10 – 20 buckets stretching from Vickies Gifts (between Woolworths and the S&H Greenstamps redemption store) down to Stix. It its last days, the same problems happened, but because of 25 years of decay. WHEW! River Roads… that mall was one dangerous spot in the mid to late 80’s. People ignorantly and rudely referred to it as “N**ger Roads Mall” (no surprise as St. Louis is still a city with great racist undertones). What once had been a wonderful mall had become a mall notorious for muggings, auto thefts, and later, murder. Dillard’s pulled out in the mid 80’s, the very large JCPenney was downgraded to one of the first JC Penney Outlet Stores at the same time. The bad reputation only got worse when Woolworth closed in 1991 (in what would be the first, massive round of store closings for the chain) and left a large junior anchor spot that occupied 75% of one side of a wing of the mall unoccupied up until the time the mall was locked down. River Roads could have been saved with some ingenuity even as late as the mid to late 1990’s by trying to attract chains like AJ Wright and apparel chains like Rainbow but this didn’t happen due to the mall owner being a known retail slumlord. River Roads spent its last 12 years as a festering eyesore and to be honest, it’s current demolition is the best thing anybody could do for it because the structure had been so neglected that it was well beyond saving at this point. When I last drove by, small trees could be seen growing on the roof of the 3 story building that formerly housed Dillard’s. Sleep well River Roads, our dear old friend. There is really something about this place. I know it met a bad end, but there is something really striking and sinister about this sinister that it looked like it had from day one. It reminds me of my own lost Cobb Center that met its fate in 1998 after struggling since 1973…a sinister looking and sad little mall that started dying very early on similar to this one. One thing I’m dying to know about River Roads Mall is that one-story building with the big arched windows that appeared to be attached to that truly wicked Stix building. What was the function of that? Was that some sort of a grand main entrance to the Stix store or what? @Georgia Retail Memories, I would like to correct the information that someone told you. It was not called the Steamboat Room Restaurant. There was a Steamboad Room Restaurant in the mall but that was a dining room for the old Stix Baer and Fuller department store that was bought out by Dillard’s. We ate there on many occasions, lastly in about 1975. P. S. Steamboat Room connected to Woolworth’s. It, too, was a nice place to eat in its day. I have a lot of fond memories of that mall. Too bad it had to die such a painful death. @Georgia Retail Memories, If you are referring to the building that was at the base of the green & gray art deco wall of the Stix building that was The Pavilion Restaurant. Somewhat elegant for a suburban mall restaurant in the 60’s it hosted Rotary Club and various other civic meetings for many years.. 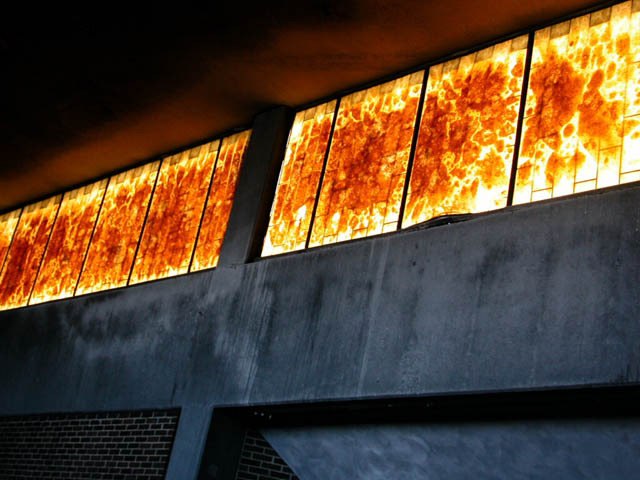 Correction: there is something really striking and sinister abou tthis mall that it looked like it had from day one. I’ll also add “another sinister” on the Cobb Center sentence. I should have proofread and not used the word “sinister” so much, but it’s a pretty good description of the most outlandish of the 60’s and 70’s malls and a feel I got in the ones I knew from my childhood in the early 80’s. Hey Georgia Retail Memories: The building next to the old Stix Baer and Fuller was a reastaurant called The Steamboat Room. A paddlewheel steamboat was the logo associated with River Roads Mall. I ate at The Steamboat Room once as a small child and don’t remember much about it BUT I don’t recall it being two stories. I think it was one strory and that the cieling raised in the center to give the place kind of a “Roman Arcade” feeling inside. Hope this helps. 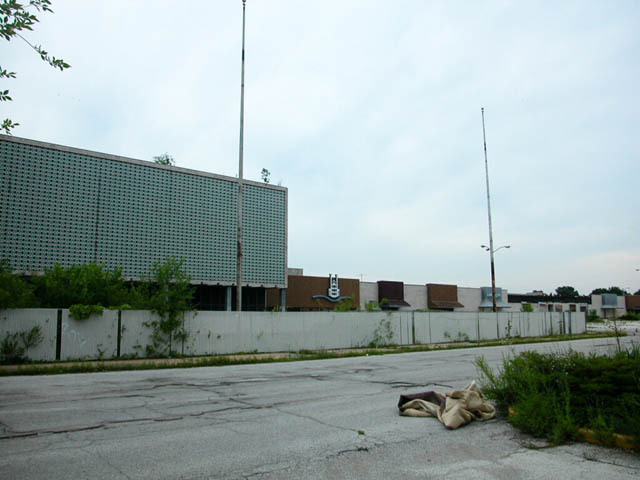 Drove by the old River Roads Mall today – large portions, including the old JC Penney & Styx, Baer, and Fuller have been torn down, but piles of debris, and a good portion of the mall still are standing left totally vacant. The Food 4 Less grocery store is the only thing still operating in the middle of what looks like a warzone. I grew up in Jennings in the 60’s, 70’s and 80’s. The pictures of the mall choked me up. I loved this mall growing up and spent most of my days there. It makes me sad to see what it and Jennings has become. This was a safe city up until the 80’s and then it went downhill from there. I will always treasure my memories of these malls and the place I call home. Hopefully someday this world will turn around and it will be safe to walk and drive the streets again. Does anyone remember the toystore next to Dillards that had the monorail that ran through the top of the store? I am 43 and I do remember that toy store monorail. I think it may have been seasonal? In any case it was called the Gumdrop Express. This brings back such great memories. I do remember the toy store with the monorail. I think it was part of Stix, and it was seasonal. I remember the puppet show, too. Haven’t thought of that in many years. I, too, spent many days at River Roads. I ate my first soft pretzel at the counter at Woolworths. Remember the pizza there? I worked at the Life Uniform Shop through high school and college. @Denise, That Woolworth’s pizza was the only thing that I COULDN’T eat! We walked down there for many a lunch “hour” (30 minutes) in high school and ate while we walked back. I ate soooo many corn dogs drowned in mustard, but never pizza. The popcorn was great, but took too long to eat! Even by the time I was in HS (1989-1993), RR was at least decent. Granted, it wasn’t Jamestown Mall or Northwest, but it was a nice place to go and people watch. I didn’t feel any less safe there than I did in any other mall (well, St. Louis Centre, even in its heyday was…interesting). 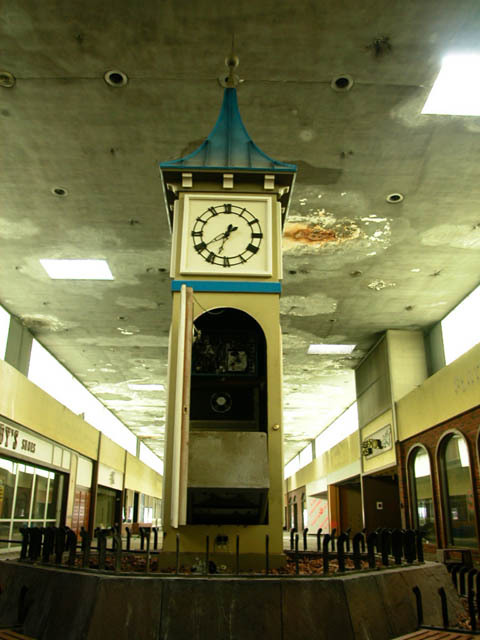 I miss the chiming clock in the middle of the mall, the Easter Bunny, the jewelry/fur stores that let idiot kids (me) try on minks and diamonds…Ah, the good old days! @Kelley, Jennings is still a bit of a slum in the south but I walk the streets and people are generally friendly. Stix was the one who ran the Bubblegum Express monorail. It had other names and was redecorated several times but I remember that name the best. I remember looking down at the jewelry counters as we moved around the store. I hope someone finds some pictures because some people won’t even believe a store had a monorail on their ceiling. @stevels, Yeah it was the Gumdrop Express like Todd said. I remember the singing plastic figures now too. @Kelley, lived in STL in the mid 80’s to Summer 1990, my ex worked at the wig store there, the owner was a Korean woman. Even then you would the stores gradually closing one by one. We had to drive from Skinker and Delmar straight North to get to the store, that was a real obstacle course! @Kelley, Hi. I have very fond memories of riding the monorail attached to the ceiling of that store. especially at Christmas. It’s like no one seems to remember that. I loved riding the bus with my grandma to the mall and eating lunch at the Woolworth’s. @Kelley, I lived in Illinois and my parents used to cross the river and shop at Northland and River Roads. I vividly remember the ceiling tram at Stix Barr & Fuller ( I had to have been between 4 yrs and 6 yrs old because I truly don’t think anyone over 6 would fit) Their was a wooden staircase that was behind wire that lead up to the boarding area. There were 3 or 4 inclosed cars that were connected by accordion crawl throughs. Each car had little seats at each window to look through and when the tram went overhead all the parents below would look up and wave. I looked so forward to going and riding the tram and getting HUGE warm pretzel’s and the little hot bags of cashews from the Woolworth’s snack counter. I wouldn’t trade my childhood with any kid today. Wow, this really brings back memories. Also like Kelley, I’m a child of Jennings from the 60s and 70s. River Roads was THE place to go when I was a kid/young teenager, before I was able to drive. Lots of great memories of eating at the Steamboat Room and screwing around at the video game place off of the side entrance. On Sundays, when the malls used to be closed, we would shoot model rockets from the JCPenney parking lot. Great times. Part of the downward spiral was RiverRoads was a transportation hub for the Bi-State bus system that would link North and East St. Louis residents to the mall. Great for the mall, business wise, for a while, but it ended up brining in some gang elements that caused problems. It’s sad to see these old pictures, but I guess nothing is suppose to last forever. @Jeff B, More buried memories… My dad and I nailed some runner lines in that parking lot and ran the alcohol powered miniature funny cars there. We did the rockets over at the Fairview school football field. As far as I know the buses didn’t link to East St Louis and you could blame the demise of the mall on people who had to run to St. Charles because they spotted one African American in their stores…. Well if u lived there through the 70-80 like i had, graduated from Jennings High, and slowly watch year after year friends getting mugged, homes robbed and unable to go to River Roads at night without a large group of friends, you would want to move also. Jennings was nearly 50% black middle class during 80s, and many of my friends whom first to leave were black, moved further north into Florrisant. The bus line didn’t help, but for my family it was North Twin Drive In, thugs from all over St Louis white and black came there to watch midnight movies. Hit the mall then the movies usually jumping my parents fence to do so, free movies. But in all the whole experience i wouldn’t change a thing, GO WARRIORS. @ MU Alum: Wasn’t the (sinister) building outside Stix a restaurant called “The Pavilion”? It was in a strange location–not easily accessible from anywhere. The Steamboat Room was Woolworth’s restaurant in the mall. I used to eat there a lot as a kid. Does anyone remember what other few retailers were in the tiny lower mall area near the Pavilion? I remember only a barber shop. @Brad Leonard, We ate at the Steamboat Room every Sunday evening and we even had the same waitress. Juanita knew about what my mom and dad would want to order. Here’s a couple answers that might help . . . the mysterious archways by the Dillards were decorative. Behind the arches was the Pavillion Restuarant (also part of Dillards). At one point Dillards also had a bakery department kittycorner from the restaurant on the way out of the side doors. Arches seemed to be an architectural theme for department stores in the 1960s — Famous Barr also used them extensively in its domes (Northwest Plaza, South County, and West County (and maybe WestRoads)).. I do remember the monorail in the toy store next to Dillards. 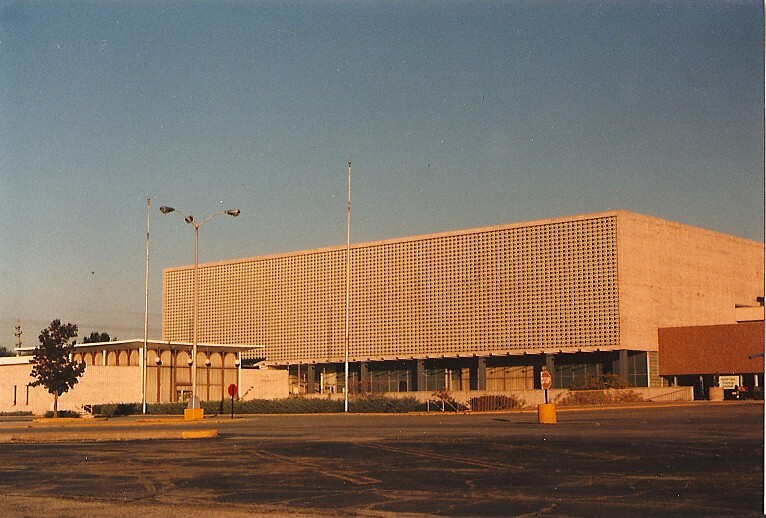 Actually, Dillards, at the time (1960s), was Stix, Baer, and Fuller. The toy store was part of Stix. Regarding the stores in the small “basement” annex of the mall near Dillards, there was once a “Yarn Barn,” the office of my dentist, Dr. Scott (and before him, his father), and a small art gallery. At the base of the steps there was a fountain (with blue tile I think) that you could throw coins in. I understand that when the Mall opened in the 1950s there was an outdoor seating area and fountains in the lower level courtyard (outside the annex) where concerts were held and people met on summer eveings. This was a bit before my time so I don’t remember it firsthand. Not far from the Mall there was also a Zayre discount store, Howard Johnsons, and Katz Drugstore. I’ve also heard that RiverRoads was the first indoor mall in Missouri (the first outdoor mall being Country Club Plaza in Kansas City). @Barb F, I think Zayer’s had another name at first. My family owned and opeated Plattners Modern Man for over 20 years at River Roads. Also, our corportate office was in the lower level of the mall. We were among the last tenants. I have fond memories of working at River Roads. @Tony, Everytime a new mall opens an old one dies. They opened the Mills and now Northwest Plaza went into bankruptcy. It is interesting how a Mall can bring back so many happy memories for people. Whenever I meet “northsiders” and they are “of a certain age,” it is always fun to talk about Riverroads. Was the Plattners’ store in the annex that opened for JC Penney? I remember the Harvest House cafeteria, too — was it somehow owned by the Woolworth company? I kind of remember the lineup on the east end — Vicki’s cardshop, Woolworths, the Woolworth’s steamboat restaurant, Harvest House, (and, a really long time ago, I think there was some kind of a little sausage/deli store near the Harvest House). And of course the Walgreen’s and its “Wag’s” restaurant. I always liked the food Woolworth’s served at it’s snack bar at the entrance to the store. There was one very nice lady who seemed to have worked there for years. I loved that pizza they made and those grilled hot dogs. Woolworths was were I first had a “frozen Coke” — a real novelty then. They also made these little donuts for a while and sold them in a little case next to the snack bar — greasy little things, but they were good. I’ll have to get my camera out sometime and go up there and see what’s left. I think they started taking it down but never finished. I Grew Up and lived at:[ 8866,St.Cyr st]………..
only a few Blocks up the street From This Mall. standing in the Center of the Walk in Area,.. I haven’t back to Jennings Mo. “Does anyone remember the toystore next to Dillards that had the monorail that ran through the top of the store? So many Memories – All gone now,…..
Just ran across this website. As a longtime shopper and later employee in RiverRoads, I was devastated at its demise. I, too, explored this vast “playground” starting in late 2003 after a mall roof fire was on the local news. I figured the firemen made it easy to get in, as careless as they are with chopping holes through everything in their way. Sure enough, it was a breeze going in the mall entrance doors by Stix. My brother and I managed to get into every nook and cranny, including the office of the shopping center on the mall’s lower level, and much to our surprise, all records, files, etc. were intact – simply abandoned for lack of anyone wanting them or caring about them. That is, until I came along! I now have enough memorabilia to start a RiverRoads museum that would rival the Titanic exhibit! I have the original contracts dated 1959 whereby Stix agreed to be the main anchor and had veto power over any store elsewhere in the entire mall – a list of prospective tenants was listed for Stix to say yay or nay to. I also have the large sheet blueprints to Stix! I also have several volumes of the builder’s specs of constructing the building. I will always have a warm place in my heart for Woolworth’s, perhaps it was that snack bar that I still dream about at night! Perhaps it is the infamous Steamboat room restaurant of which, on our last visit inside the mall in Jan., 2007 just before demolition workers destroyed that section, I sawed off a nice section of the unforgettable wood white railing, steamboat motif, outside the restaurant facing the mall. I also have, from the main office of the mall, many 8 x 10 photos and other items. I will write more later if anyone is interested, such as our discovery in the basement credit dept of Stix (no, not a bag of money!) and what it took to get into the barricaded bowling alley. By the way, the demolition workers were first class hoosier jerks! Very unfriendly and disrespectful to history! @Bob, Where’s your website? Our entire Fairview and Jennings High FB group would be interested. Who sawed off the railing at the Steamboat Room ? And I guess I’m proud of it ! I think a RiverRoads Museum would rival the Titanic Exhibit! We could even set up a Steamboat Room and serve food! (turkey club, please)As far as the bowling alley, well, it wasn’t easy! Apparently at some point in time the stairwell leading down to the bowling alley had been permanently barricaded with a plywood wall, very well constructing about halfway down the stairs on the first landing. We were unprepared on our first visit to tackle this. On our second visit we brought tools. My brother (I better give him credit here!) and I used crowbars to break through the very well built wall and break open a small area that we could get through. This took much time! Then we got down to the glass doors entrance only to find the doors closed and locked! these were the only retail doors in the entire mall locked – just our luck! We were going to smash out the glass except for the fact that there was chicken wire between the sheets of glass, and we did not have goggles to protect our eyes from flying shreds of glass. It wasn’t until a couple years later (2006) that upon a visit everything was open thanks to the demolition morons. They had run power down there to begin their work. 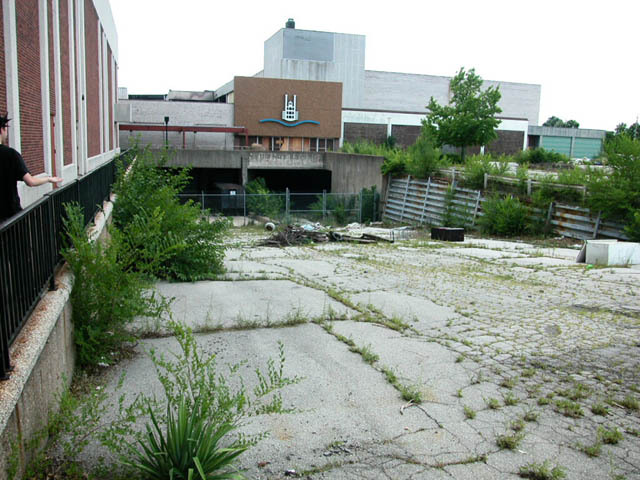 It was like a Twilight Zone walk back in time – deteriorated, but still the once magnificent SPENCERS LANES was recognizable. The wood lanes were still there, with a few pins (I have one of those as well!) and balls. The great ’60’s look cocktail lounge still had those mod lamps hanging down from the ceiling – we couldn’t break one off for fear of pulling down the entire ceiling. If anyone recalls, along the far side of the lanes at the back, there was an entrance that lead into the mall’s lower level and connected. In the bowling alley office there was little of consequence, a little paperwork from its final days that I could not pinpoint what year. Bob — You are a hero. I, too, explored the innerworkings of the mall a few years ago, but with much trepidation. I stayed close to the opening so I felt relatively safe, but I was a bit overcome by the mildew smell and was terified of seeing a rat. I am really thinking about going back to explore a little more (I understand some of the mall is still standing) and to take a few more photos. Is there anything special you’d recommend exploring? (And, did you see any rats?!) Hope I don’t get arrested for tresspassing! Wow! Who’d have thought that the old RR mall would elicit so many comments. I worked at J C Penney from about 1964-1970. I have fond memories of the fried chicken and pizza from Woolworth’s and the burgers at Walgreen’s. I also ate at the Pavillion and once in a while at the bowling alley. The Penney store had only one escalator that always ran “up”. When Mr. Penney visited the store, they reversed it so he could ride down. Before the expansion, Penney’s had taken over the store next door which was called “the annex” where we sold seasonal items. You had to go through a labyrinth in the basement to get there from the main store. Does anyone remember the Saturday morning KXOK radio shows with Johnny Rabbitt from the mall in front of Stix? They really drew a crowd. It’s sad to see the decline in the neighborhood and in the mall. The nearby Northland Shopping Center, an older strip center with Famous Barr as the anchor, has also fallen into disrepair. I haven’t been to Jennings in a long time, but I believe it’s still standing although mostly empty. @Mike, Northland is now the Buzz Westfall center (although people still just call it Northland) and is complete rebuild strip mall with Shnucks and Target the hub stores. There’s a Sonic, a 5/3 rds bank and GenX. Occupancy is 95% with the Starbucks leaving fast. Barb F. – Hate to tell you this, but it is ALL gone! Just a memory sad to say because of the poor planning by Jennings City leaders who went into this project without concrete plans or a solid developer. The latest developer has just gone broke and the huge cavernous crater that greets all along Jennings and Halls Ferry Roads will be a far worse eyesore than a boarded up historic mall. The last of the mall came down late last summer. I wasn’t worried about rats when I ventured in because rats will only hang around if there’s a food source – none at all inside abandoned River Roads. I never saw any, and we were in the far deep corners of all floors! Stix basement floor was interesting, especially the credit dept. area and main offices – we even found the walk-in main bank vault of Stix, door open! I have many more mementos than I’m willing to admit at this point in time since the demolition people were such jerks – I’m glad they went broke! We had large, high-powered lanterns/spotlights when we went in and gloves. Virtually all store fixtures were gone – I wonder if there was a liquidation sale in the ’90’s of those items? I was amazed at how much was left in Stix. For instance, we found the main key room with wall racks of labeled keys for every part of Stix. I now own the key to the main front entrance of Stix River Roads! The restaurant, Pavillion and outer coffeee shop, still had all fixtures – counter, stools, kitchen equipment, etc. That surprised me. We were tempted to cook lunch for oursleves in there and sit at the counter and eat! What would the police have thought if they walked in on that?? They’d be calling for the men in the little white coats! Please email the mayor of jennings on the city website and tell him what a botched project this has been, that River Roads never should have been torn down. Bob — I will gladly email. Now this may sound nutty, but I may still go by and take a final look at that crater (and pay my last respects). What a gold mine you hit exploring that Stix building! I’d love it! Who would have thought they’d leave all those files behind? Any interesting photos in the files? 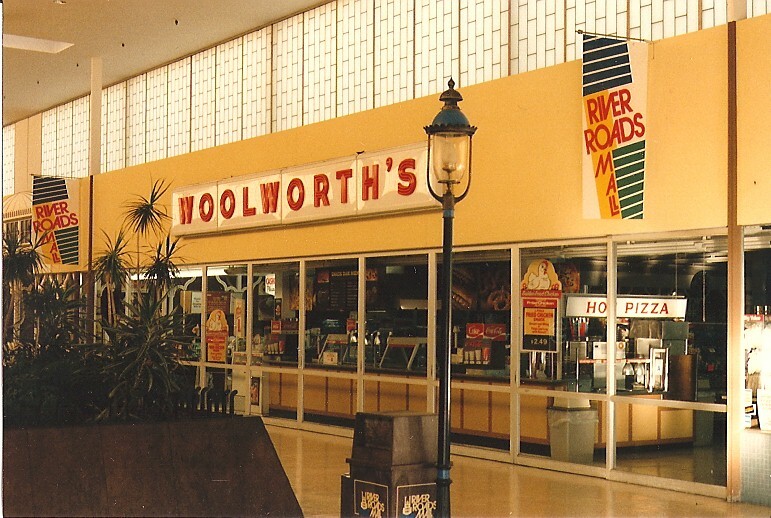 My favorite store was Woolworths. 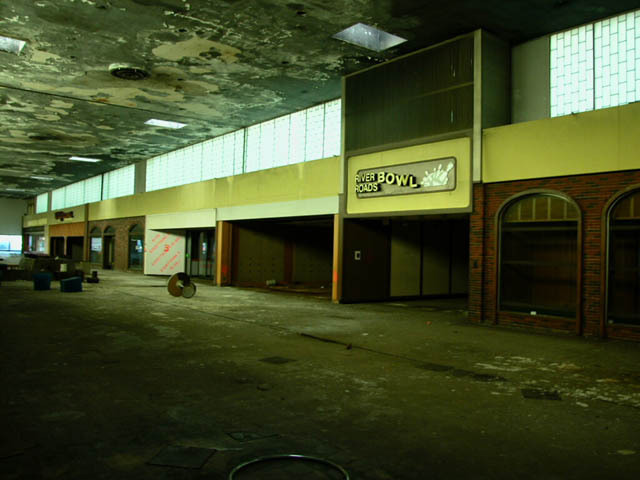 I did a google image search and was so surprised at the number of people who posted photos of the mall in its decline. I had planned to write a freelance story on its history to coincide with its final dismantling, but, alas, I never thought they’d actually get around to tearing it down. I am, however, pleased to report that on my last visit (and timid exploration), I did swipe the “PUSH” plates from the entrance doors (on the Kroger side). I’m so glad I did! I spent just about everyday of my early life at RR’s. I walked across New Halls Ferry through the mall(about 7:30AM) and down Berkay to Jennings Elementary. I was in 5th grade 1964. Could you imagine allowing a child to do that in the present. River Road…what Great Memories Krogers, Woolworth…we’d go downstairs and they had a toy/hobbie shop down there, Walgreens…burgers and cherry cokes, The Steamboat Room, Harvest House Cafeteria, Downs mens store, Wolfs another mens store, Union Jack, Spencers Bowling Alley…wow…Stix, The Pavilion…..on and on…The toystore with the monarail at Christmas…the memories…This was a crossroads..where the kids from Northwest City, Jennings, Riverview, Rosary met. During the holiday season the parking lot which surrounded the entire shopping center..would be jammed packed!..even on my street Bluegrass…River Roads thank you for the memories..There was a specialness to grow up in “North County”…Jennings was a wonderful place…it was safe….In 1969…I ran across the dark RR parking lot at 11:30PM…to head home after a stop at Cuzie’s Pizzaria…our parents didn’t have to worry. That’s the kind of neighborhood it was…I know I’ve gotten of base a little…I’m just so greatful I got to experience Jennings during it’s heydays 50’s to the 70’s… May it rest in peace. Just came across this posting and I had to respond! RR was a favorite hangout of mine, too. My mom and I would take the bus from Walnut Park in the 60s, eat at the Harvest House Cafeteria and shop all day. I worked at the mall, at the Life Uniform Shop, through high school and college. I also worked briefly at Cusies, which was owned by my sister-in-law’s uncle. Gosh, what great memories!!! About a year ago I drove by the site of what used to be RR – now just a big crater. I wish I had been able to see it before it was demolished! Cusies had its own special flavor in their pizza, and I’ve never found it since. A hamburger and mushroom pizza with a glass of milk was heavenly…I was too young to order a beer! Does anyone still have their recipe? Is it lost forever? I can still remember the taste clearly, but I don’t know what it was. Somebody please bring it back! Hi, I was just looking up Cusie’s to see what came up and saw this website. I worked at Cusie’s from 1969 until I graduated form college in 1978. Started out washing dishes by hand when I was 15, then moved up to cook and pizza maker the next year. It was a great place to work. In the summer and on weekends i prepared bulk food. Ive made thousands of gallons of the sauce. We used the same sauce for pasta and pizza. I still make it to this day. It is basically traditional, thick sweet Sicilian sauce. We measured by those large industrial size cans. Basically it was 5 cans of t sauce, 3 cans of t paste, 8 cans of water, 6 coffee cups of sugar and two of salt. all simmered on the stove for hours. The owner was formerly a butcher and they cut their own meet. Sometimes when we finished cutting the pork butts to make sausage we would put the bones in the sauce. Great memories. When did they neighborhood go bad and why? Oh my, I’m part of the group with fond memories of the 60s and River Roads. I bought my first lipstick at Woolworth’s, and got my first pair of heels at Stix. And I remember the special meals at the Pavilion and how methodically my friends and I would go through the Juniors section at Stix. And, for the person who remembers the pizza prices at Woolworth’s I’ll note that the price difference between cheese and sausage pizza slices was often determined for us by whether we’d have enough money for the bus ride home, in the summer when you hadn’t bought a bus pass for school and could use that. It is sad that it’s gone, because it feels like those experiences are just fragile memories. Bob, is there any chance that some of the ephemera or bits of fixtures could be put up on ebaY, for those of us who might like to buy something tangible to hold the memories? Well, Hyacinth, right now I wouldn’t want to part with any of them – I have some nice signs, some with the River Roads steamboat logo on them. I also have a tile from the floor of the main mall! It is very old, perhaps original. I have several of the ceramic aqua colored “bow tie” bricks that made up the colorful front of Stix. I also have the blueprints to Stix – yep, the entire building blueprints! Maybe I could take some close up photos of these and email them to whoever is interested in seeing. In ’03 on our first visit inside, the coffee shop just outside the Pavillion Restauarant was so inntact with its counter and stools still there that on a subsequent visit we packed a lunch and sat there at the counter and ate it – just like it was 1970 again and we were eating in the coffee shop! The men in white would have thrown a net over us! Wow, great posts. My family’s store, Plattners Modern Man was originally located in a corner location near Styx. Later (late 70’s) we moved into the old Wolfs location. Sorry about the plywood barricade to the bowing alley. Once the bowing alley closed, people would go down there and use that area as a urinal. The smell was so bad that I asked the mall maintence staff to do something to deter people from going down there. So, they put up the barricade. Also, this was done for safety reasons. I live in Arizona and haven’t been to Jennings for years, I am sorry to see the mall gone. I lived in Jennings from 1970 – 1983. I used to lived in Hathaway Hills which faced Halls Ferry. I walked to Northview Elem. school across the parking lot of the mall or cut through to and stop at the arcade. I used to go to the Woolworth with my Grandma and buy “jellies” those clear plastic shoes. My Mom worked at Worth’s in the 80’s. I remember the Santa and the clock. My Grandparents were on a bowling league at the alley downstairs. I can still remember running my hand along the long wave painted on the wall all the way down the hall from the inside of the mall to the steps that led downstairs. It just gets to you that people can ruin things and not see that they have only themselves to blame for living in such terrible conditions. Jennings was a nice area when I was a kid. I could walk anywhere or ride my bike all over with no problems. We moved in 1983 because the area was just going downhill. They used to have cool haunted houses in the empty stores too. If you’re still watching this page — I’d be VERY interested in seeing some of those blueprints. I only saw River Roads at the very end of its life, but I fell in love with the tile mosaic designs on the outside of the building. Some of those tiles… mysteriously found their way to my back porch. How could that have happened?! I just don’t know! In particular, if those documents list the name of the architectural firm that designed the building, I’d really love to know who it was! Mr. Powers, Yes, the blueprints are dated and detailed. Better yet, there were several volumes of books in the office detailing the construction of Stix in incredible detail, down to the exact building specs, types of materials to be used, etc. I took the more interesting of those, but not the entire collection. I have some of the mosaic tiles too, although we were threatned by the hillbilly demolition worker with a trespassing charge – no respect for what River Roads stood for! It Looks intimidating. This mall would have made a perfect set for a Hirax video during the 80’s. I used to love this place as a kid. I was out there recently (11/15/2008) and about all that is left of River Roads is a big field and gravel heap. The only thing left standing is the Food for Less grocery store that used to be attached to the end of the mall near Woolworth. I shot some video as I passed it. It’s sad that it wound up like this. It is a shame that certain people still have the same undertones of racism. Say what you REALLY feel. I personally think that RR’s decline came from white people moving out of the neighborhood afraid of black people as usual and retailers feeling that our money is not green enough. My parents shopped there more than I can count. I have fond memories of RR. The police had a lot to do with its decline I feel too. They were pulling blacks over so much for no reason, I think blacks in the neighborhood felt they rather go to St.Louis Centre or somewhere else than to deal with the racists cops there. @Mrs. Jones, you are completely wrong about what you said there. Tolerance was practiced and time ran out on the violent nature of the activity at that mall and others in North County. People don’t want to live that way, and shouldn’t have to. Do you understand that? It would be the same no matter what color the culprits were. By the way, what happened to St Louis Center? @Mrs. Jones, You are completely right. My neighbors moved to St. Charles for the sole reason that African Americans had moved in and were shopping here. It had nothing to do with violence; just ethnicity. Tolerance was NOT practiced at all. On a better note; Jennings High was much better integrated in 1975-1985 than it was before or since. Our musicals, plays and athletic teams have diverse pictures from that period. When I worked for Coca-Cola last year that Food For Less was one of my accounts. I am a white male and was harrassed non-stop while I was in that store handling my business. Taunts of “get me some soda white boy” or “kracka” were an everyday thing. That whole area is terrible and deserves to be demolished. Nothing but crime and poverty. Most of the decent people that lived there moved away when the neighborhood became so drug infested that people were scared for their lives. This mall didnt die because of racist police, it died because the people with money to spend left. North County in general cannot support a mall anymore, look at NW Plaza and Jamestown, much less the Jennings area. @Some guy, @Some guy, .. You really need to do a little history BEFORE you speak on anything! “Nothing but crime and poverty” I guess you made this judgment based off one store in a mall that closed. Did you take a look around at the new houses near the mall? Did you notice that Northland shopping center had been rebuilt? No you didn’t!! Ferguson in 2001was in the same state that Jennings was in, so if Jennings need to be torn down then Ferguson needs to go as well..
“There’s a reason the scared white folk moved to St. Charles and West County”.. I worked and still work in the Saint Charles/Saint Peters area.. There is crime out there as well. Mid Rivers Mall will have its day with all the WHITE kids that like to fight, steal and hang out at the mall running off the people who came to shop. If I used your way of thinking then ALL white males are racist a**hole. Fortunately I was raised better, have more education and have not let the bad moments I have had shape my outlook on anything. @Some guy, So, no crime in St. Charles county. Good to know! I’ll have to ask all the kids I went to school with (in Jennings) that moved there if it’s crime free. Surely there are no meth-heads or just regular criminals in white neighborhoods! Thanks! I second that. The Salem Mall area in NW Dayton is the same way, with thugs, problem people, and welfare people. That mall died in 2005 because of such people. Decent people were forced to move out because of the demographics. Jennings used to be a nice area until the 80s. It’s the same with NW Dayton. That used to be a nice area until the late 80s-early nineties. Section 8 housing moved in as well as too many bus stops in and around the mall. I feel sorry for the people in south suburbs of Dayton because I see the same pattern of degradation by problem people along with section 8 apartments. Dayton Mall’s fate is being sealed as I type. Problem people are the reason of why areas cannot succeed. I remember my grandmother taking me there when I was just around 7 yrs old back in the early ’70s. She lived within walking distance and she would have this vise-like grip on my hand as we crossed a 4 lane road. She would wear me out walking all around that mall. She wouldn’t let me touch anything. I remember Woolworths, and if I’m not mistaken, some of the escalators were more of an inclined conveyor belt type. I drove by that spot recently and it’s just a vacant lot now. That is so true! It’s more than a coincidence that when the area “changed”, crime and violence that had never been seen there before for decades overcame it like the plague. What a easy cop out – “racist police pulling people over for no reason” – give me a break! Are you proud now of what’s left of Jennings and RiverRoads? What a pile of crap – stores pulling out because your money wasn’t green enough? That’s the most absurd thing I’ve ever heard – a business leaving with good business! And now, Jamestown and Northwest Plaza are latter year carbon copies. Do you still live in Jennings? If so, I hope you enjoy what’s left of it and staring at a pile of rubble everytime you drive by RiverRoads. @Bob, Jennings is coming back. I’ve not seen it looking this good in years. The hole in RR is because of the economic housing bubble bursting on those developers. Their loans got called. Even so the number of homes owned and maintained in the north Jennings is holding, Northland is redeveloped and near full occupancy, there are two new Walgreens and a Family Dollar. Velvet Freeze is thriving and so is Knodels’ There are new nail salons and stores along W. Florissant. Floridell Hills finally rebuilt their City Hall and the Jennings Station Road development is well on its way. I don’t see evidence of the recession in Jennings. i have never heard another person EVER say wags resteraunt. my mom worked at a wags in lake worth , florida for 6 years. nice to hear someone say that. remeber the little raccoon waggles? What a shame but hardly surprising. I have relatives that still own a bakery on West Florissant not far from Northland. The neighborhood is about as low as it can go. Many of the home in Jennings are condemned and being torn down. Not much more than discount beauty supplies and car title loan places. I grew up in the area until 1967 with my grandparents and then frequently went to the mall through the early 70s. Kind of an odd feeling to look at the photos and remember walking or standing in those same spots all those many years ago. Seems like yesterday. My grandmother did all of her shopping at that Kroger. All of my “sitting on santas knee” photos were taken there. I remember many a roast beef and lemon mirangue pie at the paddlewheel room. Sometimes I miss the old cafaterias. The barber shop downstairs butchered my hair in 3rd grade to the point that I refused to go to school for several days. What I remember most was the old S&P stamp store that was outside between Kroger and the mall. Stix, Famous, and many other stores would give you stamps every time you bought something. You saved the stamps in a book and then took the books to the store to redeem for clocks, furniture, cars, etc. Most of it was cheap little stuff, but if you really saved the books you could get some decent items. The worlds first frequent shopping club. I guess they closed about 1970. Thanks for letting me stroll down amnesia lane for awhile. 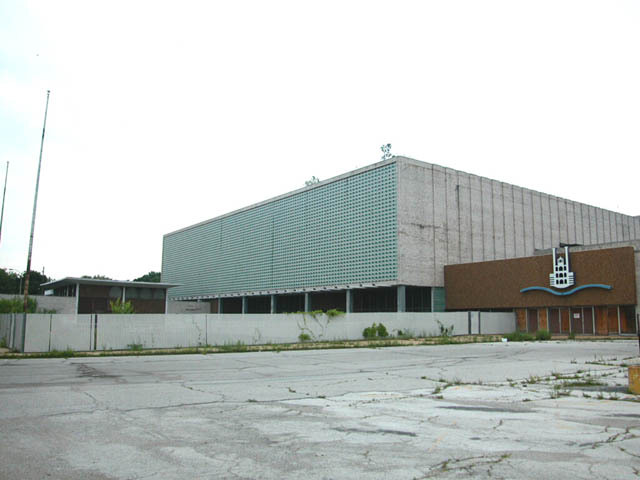 I followed links to here from deadmalls.com which has photos of this Northland, Northwest, Crestwood, and several others. All of which I remember. Also, I remember meeting the senior manager for enclosing Northwest over drinks at the old Chase. He was so proud that not a single store would have to be closed for a day during renovation. Little consolation now. Sure wish we could stop the urban sprawl that creates this kind of wasted space and effort. Wish we would spend a little less expanding roads and sewers to St. Charles and invest a few bucks in maintaining what we already built. It would keep property values in these areas up and crime down. Any chance that your relative’s bakery is KNODELS? I grew up in Walnut Park – in North St. Louis. We went to Knodels often. I couldn’t believe they were still in business in the 90s, and in fact they did my wedding cake in 91! @Steve, I walk by Knodels a few times a week. 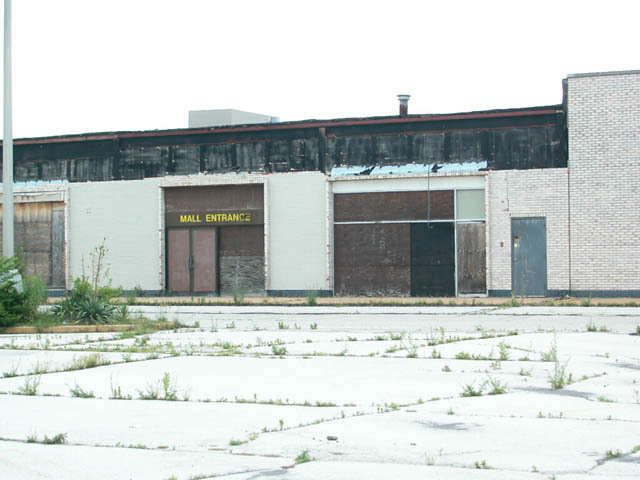 Zoning laws would have been the key to keeping south Jennings from decay. You can walk 5 blocks over from Knodels into St. Louis city and see well maintained brick homes then come back to Jennings and see homes built too close to each other with no building codes falling apart because they were badly built. Thanks for the stroll down memory lane. I, like many others, grew up in Jennings in the 70’s. Lived on St. Cyr and then Petrova. Left in 1980. Have alot a great memories hanging out at the mall, just sitting around. Jennings was a great, safe place to grow up. Too bad it is no longer. I remember the steamboat room had great food. My mother often tells me they had the best hot dogs around. But these pictures do bring back (distant) memories. Stix/Dillard’s was gone before I ever had any recollection of the mall. I do remember the JCPenny though. I got my first bicycle at the RR Penny’s! 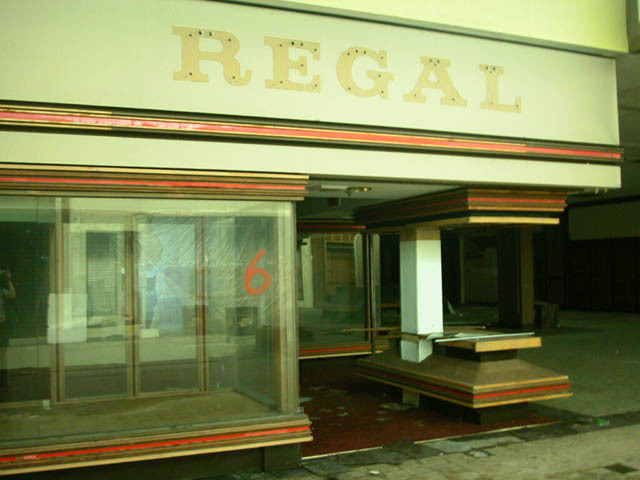 Very sad to see RR go, and all the other North County landmark’s go. But, as with many “white flight” families, we moved on, and I grew up a West County kid. @Andy, I am pretty sure the “conveyor belt” type you remember were in the Zayre store. @Todd Yes, Zayre had the only grooved belt escalators I’d ever seen. And the shopping carts had grooved wheels with brake pads that engaged when the wheels fit into the belt. An interesting way to allow carts on the two floors. I remember the bowling ally and pool hall downstairs half way through the mall back in the 70s people like rick smole,roger collins,andy jones,Myself dave wright,we came of age here in this mall if anybody reconises these names please post something giving your name would like to know if any of these people can be reached. @Dave Wright, I knew you from school and scouts. I still live in area and have been by the malls before they were distroyed. Wished I’d have thought of exploring like others have. I lived in Jennings in the 70’s and 80’s I went to Rosary high school for one year back about 80-81 school year. I took a bistate bus to RR and then caught another one to school. I ended up transferring to Jennings Sr, High. There used to be a space invaders game at woolworth’s that I would play while waiting for the bus. lol I remember going there as a little kid also. I used to go to JC Penneys outlet store before it moved to Jamestown mall. What a shame Jennings has become. To Dave Wright: I know Rick Smole, have been friends with him for a long time. He moved to Festus around 2000. He works in Imperial, MO. I fondly remember RR mall especially the toy store and the Gumball Express train that was only used during Christmas. Brings back sad memories but we all know that everything changes right? I have lived in NorthernCalifornia for 35 years and have visited RR on occasion until the early 90s when the only retailers left were Walgreens and a Korean wig store and grocery store. I do remember the excellent pizza at Woolworth’s and the Steamboat Room but most of all I miss that train. If my memory serves me correctly (I’m almost 50) passengers boarded the train at the back of the former Stix, Baer & Fuller dept store and the train was located on the ceiling where it went outside Stix and around the perimeter of the mall. You could see all the Christmas decorations and lights especially if you went in the evening. I always told myself that if I ever got rich I would build myself a Gumdrop Express monorail on the ceiling of my mansion (that never happened). Those were the days, too bad they’re gone. @Robin Kay, I don’t remember the monorail going but for about 150 feet long loop outside Stix and most it’s run inside the store. The last few years in the early ’90’s when I shopped there I would look at those rails near the Dillard’s entrance and think “I’m about the only one here that knows what those are”. I to remember Christmas at the mall. I am almost 50 as well and have very very fond memories. We could not wait until we could ride the monorail (although it was a little scarry as a 7yo) but what simpler times. We always went there as a family on Saturday nights. I loved the Pretzels at Woolworths! Those were memories with my father (who died in 1971) that I will never forget. I also went to the dentist on the lower level. And the animated decorations at Christmas were the best. Is it just me or did we seem to have more white christmas’s in the 60’s. Oh what a joyful time. I agree with many of the posters as to the demise of the mall. But am sorry to see it now as a past memory! I believe the RRs heyday was 65-70. I remember the parking lot being full at Christmas. I mean FULL to Jennings Road, full to the empty lot (west), and full to the south where the lot meets residential. Thousands of cars. Inside it was SO packed. Heavy activity everywhere. You could not walk comfortably there were so many people. My first job was there, cleaning the mall. I feel I have some of the best mementos having been a regular “visitor” inside the mall from ’02-’07: a several foot wide section of the white wooden Steamboat Room rail that surrounded the outside of the restaurant; the original blueprints to the entire Stix structure; the original contracts (in binders) for the creation of River Roads, the large “Wrap/Pay Cashier Here” illuminated sign that hung from the ceiling of Woolworth above the check stations, several tiles from the floor of the main mall, several Stix gift boxes, crystals from the chandeliers that amazingly still hung from the ceiling of the main floor of Stix in the 2000’s, creating an eerie time warp effect aka “The Titanic”, and much more. I have enough to open a museum if I wanted to: “River Roads – The Touring Exhibit”. I also have stacks of photos from the main office that was on the lower level. @Old Man River (Roads), have you scanned those in and posted them anywhere? It is starting to look like a St. Cyr reunion party (8898). We started going there while my folks and I still lived in Spanish Lake in th early 60’s. We would pick up Grandma, she lived on Switzer, and it seems we would spend the day there. Mom got her hair done at the beauty parlor just inside the entrance to Stix, Grandma and my sister would wait sitting on the aqua padded seats overlooking a goldfish pond??? at the Stix entrance. I would go look at the Matchbox cars in the seasonal addition to the Stix store, in the summer this area was full of outdoor furniture and Christmas stuff in the winter. I rode the monorail many times, the tracks remaining many years after the cars were gone. I spent most afternoons at the mall after school (Jennings, class of ’76) with my friends and/or girlfrend, Some random thoughts… pet store on the 3rd floor of Stix… hours of pinball at the bowling alley… guns, model kits, HO cars, pet shop and fabric store in the basement of Woolworths…and remember that guy hawking junk jewelery for years at the top of the escalators inside Woolworths? Whew, too many memories for now. It all keeps coming back….more to come. @Phil R, it was Ludwig Music. I worked there in 1974-75. John Weir taught guitar, Nick Georgeoff managed the place. Lessons were given downstairs off the tunnel. Prior to that, I worked at Ruslle Stover. Like many others here, I went to Dr. Scott, and his dad, on the lower level. I remember going to an autograph session by Ted Simmons and Al Hrabosky at the tops of the stairs!! I remember the guy playing the organs in the evenings at the Helwig store. There was a hobby store (what was it’s name?) you could buy any car, aircraft or ship model, puzzles, hot wheels, model rockets and miniature alcohol hot rods. If you were a Boy Scout they had all your badge needs. Got the box derby car kit there. I remember spending hours roaming the kits and reading the comics while mom and dad went shopping for Christmas. @stevels, Wikipedia has an article on River Roads (http://en.wikipedia.org/wiki/River_Roads_Mall) and although we can’t post our memories (no Original Research) we can make sure the article has information about the stores, Christmas shopping and such if we can find sources that published it. For example if RR is the first inside mall built in Missouri then some book or newspaper much mention that. Also if RR broke shopping records// foot traffic records then again some Post Dispatch or Globe Democrat article would mention this. That’s the trick to getting our memories into Wikipedia; uses published sources. Anyone can edit Wikipedia but the people who care will keep the article accurate and revert vandalism. The music store’s name was Ludwig’s. My sisters and i took piano lessons there for $2 each. No one mentioned the french fries at the Steamboat Room – 40 cents. Frozen Coke or orange Fanta at Woolworth’s. Vividly remember sitting in one of the recliners in Woolworth’s with The Reaper playing from one of the stereo systems – felt like the Memorex man. RR was a Bi-State bus hub – i used it for everything – rides home from Rosary after basketball practice, Red Bird Express trips to Busch. Stix was high class. The Penney’s addition came later. Parking was a nightmare because the stores were so busy. RR really was a suburban 60’s-70’s dream. Ludwig’s was definitely the name of the RR music store in the ’60s. I took guitar lessons there from Steve Torlina, who played saxophone in a great band called Vince Arter and the High Fives. The memories do come flooding back! I remember my Mom always going to Life Uniform in that mall and getting her to take me to Woolworth for a toy or pizza or pretzel. I remember when Stix closed and the JCPenney became a JCPenney Outlet around the mid 1980’s. My parents moved us out to Creve Coeur then and I remember my Mom would still go to River Roads to the Life Uniform shop there, until my Grandma’s neighbor was mugged in the parking lot on the backside of the mall (I believe that was where Woolworth was and they had an exterior entrance from the parking lot). I also remember the sunken garden that was in front of Stix and my Grandma always going to Singer Sewing Machines for stuff, and my Dad going to Slack Shack for pants. I remember a big clock that stood at the center of the mall and neat tile storefront of Stix. It’s really a shame that it was ruined and that it’s now a memory. I do not understand how anyone could label my beloved River Roads Mall “sinister”. I came of age in that mall and it held so many cherished memories for me. Dad and I bought groceries every Friday night at Kroger’s and then walked over to the mall to, as he called it, “see and be seen.” We would have milkshakes at the Walgreen’s grill, then walk down to the clock. He would usually have a seat, and I would go check out the latest fashions at The Gap, Baker’s Shoes, or Union Jack. Friends and I would go hang out on Saturdays: shop, watch cute boys, go bowling, and do all the things typical (well-mannered) teenagers did at malls during those dyas. River Roads was also where I had my first job…Walgreen’s…and met the most gorgeous guy I’d ever gone out with, who worked next door at Radio Shack. I know things change, but it felt like a part of me died with that mall. Some people have the good fortune of returning to their home towns to see very little change. Those of us who grew up in Jennings, back when it was a safe, wonderful place to live, can never go back home. @Judy, I moved to St. Louis in1971. I loved that mall, River Roads, NP. I bought so much clothing, I was the sharpest dressed in N. Co.
@Angie Stewart-Lefler, I didn’t know there had been a Gap store at River Roads. I’m 40 now, and the stores I remember are: Stix, Penny’s, Woolworth’s, Walgreen’s, the Uniform Shop, Lane Bryant, Arthur’s, Toby’s Shoes (I HATED that store as a young’n), the Slack Shack, and that’s all. Does anybody else remember stuff that was there? The monorail DID exist! I’m not losing my mind at 50! I worked in the Mall and enjoyed all the stores there. Woolworth’s, The Steamboat Room and The Harvest House Cafeteria Stand out in my mind. I worked there from 1970 and 1971. Why was that pizza a Woolworth’s so good. Is it just because it was our FIRST pizza? Like my first acid trip, I don’t know if it was so great because it was my first or because it was great LSD. Downstairs they were giving away goldfish and selling parakeets ridiculously cheap during the Grand Opening. The mall was like a circus come to town! @David Francis, Because the parakeets and fish were used to make the pizza. I know I’m a little late to this party, but I remember being as young a 10 or 11 years old and riding the bus, by myself, from Spanish Lake to RR to take drum lessons at Ludwig Music. I still remember my teacher’s name- Harry Laramie. I won’t rehash all of the memories already posted, but those hot dogs from Woolworths will always stick with me. I still haven’t found one as good in all these years. They toasted the buns on the outside! Better late than never — First job at Walgreens -lied about my age [only 15] but wanted to work. What a fun job!!! Rich, Greg ,Bob , Dennis , Super-Snyder . Pat , Sharon , Mary Lou , Julie, Barb , Cookie , where did they all go ? I was a dish washer , soda jerk , and cook ! It was 1965 and life was good….. I lived near by and played in the field before they built River Roads … and was there for the “Grand Opening” . my buddy actually got a Diamond [just the stone] that was in some of the balloons they dropped from the upper walkway . What a shame to see it go . Hope my kids had as much fun as I did !